Its been a year since I started doing this blog, so I thought it might be a good idea to go back over all 96 of them to tie up any loose ends. Back in February I detailed my worst shop habit of getting things out as I need them but not putting them back, resulting in tools piled on top of tools. Ive gotten much better. I still need to stop from time to time to put things away, but I can actually go whole hours now between those times. Hooray for me. Also in February, I revealed that my most valuable shop tool is my computer. Thats no less true today, especially since I am now a two-computer guy after buying a Mac, which sits right next to the PC. Id like to add that my second most valuable shop tool is my digital camera. Still in February was the first of my Stupid blogs, detailing truly stupid shop-related things Ive done. That was followed with additional Stupid columns in April and July. No additions for the last five months, though. Dropping a router on my head last month doesnt count because, well, that could happen to anyone. Also in March I introduced you to my lunatic neighbor who mows her lawn every day. Now that winters here and the temperature is in the 20s, she only mows once a week. She still uses a leaf blower to dust the entire street three times a week, though. In April I revealed my definitive pet peeve: the use of the prefix pre when its not necessary, which is usually never. 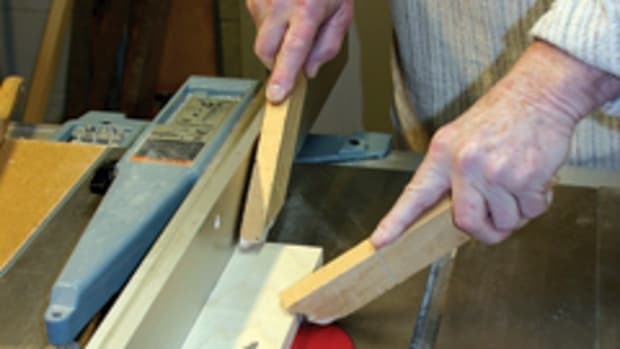 I implored the woodworking world to stop using the term pre-drill. You dont pre-drill a hole; you just drill the doggone thing. You havent improved on that, so please stop it. May 13: I did NOT get a steak for dinner. Also in May, I whined and moaned about the weird hatchback on my car which can be locked and unlocked only with a remote. It went several months permanently locked, then a few permanently unlocked. The cycle repeated itself a few times, but its now back to normal. One of the few times that the phrase Maybe it will go away worked out just fine. In June I bought an extension bed for my lathe. It is STILL in the box. Just no time to get it out, set it up and play with it. I discovered a new source of wood in June, a large cabinet/millwork shop that deals lumber on the side. Since then Ive become a regular, first-name-basis customer. In July I talked about the death of comedian George Carlin. With my recent shop re-do, I can now say that I have a place for all my stuff. George would be proud. Also July: I asked the question, Is pine sap an idiot shopping for lumber? Judging from some of the clientele around the lumber racks at the local Big Box stores, Im thinking that the answer is yes. In August I began a series of blogs detailing the building of the new storage shed that allowed me to re-do my workshop properly. That was a rewarding experience in two ways. First, it gave me the best shop layout Ive ever had. Second, I managed to milk the topic for more than half a dozen blogs. Finally, in my Nov. 14th blog, I began playing a little game. I incorporated a phrase or term from Star Trek in that one, and have done it in every blog since then. One person  an admitted Trekkie  caught on after the third one. Did you? So as we round out 2008, let me wish you all a very Happy New Year. Live long and prosper.